This publication focuses on the challenges faced by civil society to remain sustainable in response to major changes in the global political, economic and social environment. Academics and practitioners from all over the world have contributed original articles, practical notes and viewpoints which critically examine the ways in which civil society organisations are affected by and are responding to political and financial dynamics. These include reductions in traditional external aid for civil society activities, but also the growth of new forms of funding through social enterprise, philanthropy, fundraising and contractual relationships with national government. 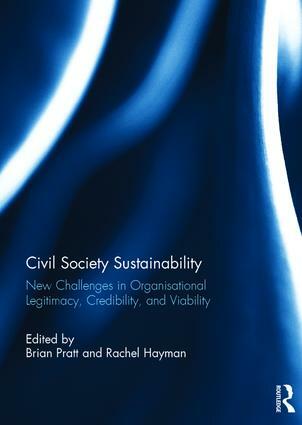 The operating environment for civil society is a central theme, with authors exploring the legitimacy and credibility of different types of civil society organisation, as well as the effects of legislative and regulatory restrictions on their sustainability. The contributions finally examine new opportunities for civil society and the prospects for organisations to emerge that are less dependent on foreign aid funding, that are more embedded in local communities, and that can bring about lasting and sustained social and economic change. This book was originally published as a special issue of Development in Practice. Brian Pratt is currently the Editor-in-Chief of Development in Practice, and previously founding Director of INTRAC. He has worked for OXFAM both in the UK and Andean countries. His research interests include sustainability and other aspects of the development of civil society, and he has written and published widely on these topics. Rachel Hayman is Director of Research, Learning and Communications at INTRAC, where she is currently leading INTRAC’s work on the impacts of the changing global political economy on the sustainability of civil society organisations. Rachel’s role at INTRAC focuses on bridging academic research, policy-making and practice.